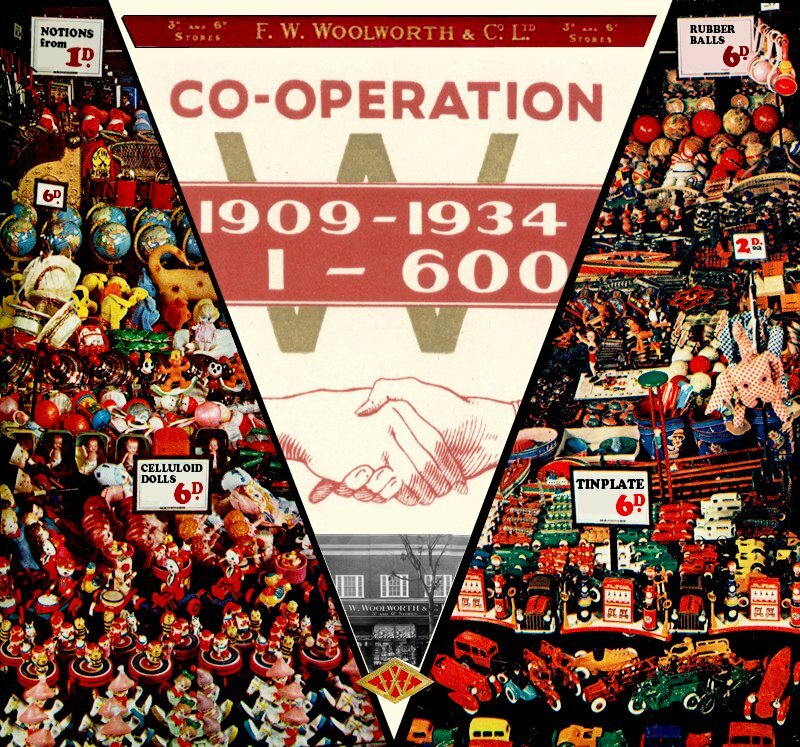 Woolworth's had expanded rapidly in Britain in the 1930s. In 1934 it had opened its 600th outlet in Wallington, Surrey, and just three years later the 700th had joined in Cheapside, London, EC1. In parallel stores had been extended, adding extra selling space to cope with increasing demand. As manufacturing costs had risen in the late 1930s, the Company had resolved to maintain its sixpenny maximum price, and had adapted its offer accordingly. This had expanded the range of Toys, and had given the range space throughout the year for the first time. After the outbreak of War, William Stephenson, the Company Chairman, had been called on to lead Aircraft Production for the war effort, placing him in a role at the heart of Government. This had highlighted the importance of maintaining morale as the United Kingdom stood alone against the might of German aggression. Toys and Games were developed to distract children as they spent long nights in air raid shelters, with the prices deliberately held to the pre-war level to keep them affordable for everyone. The gesture won over a whole generation who were to become the most loyal shoppers in the post-war period, rewarding the stores for their well planned counter-attack that began on the toy counters. During the 1930s Woolworth's Buyers went to great lengths to keep prices under sixpence. As the cost to make some household products rose, the range was adapted. The range of Toys and Games was expanded, and was stocked all year round for the first time. There were many innovations in the product range, with an early plastic, bakelite, taking the place of the celluloid, composition and tinplate that had previously been used for toy manufacture. The new wonder material allowed more exciting products to be developed, like cameras, fancy toy cars and clockwork trains. As Europe began to re-arm and public fears of another war began to grow, miniature aeroplanes, tanks and soldiers became the best sellers. Fear of war brought new challenges. Some of the largest suppliers, particularly those that had embraced bakelite, chose to convert their factories to make munitions and military supplies. This allowed them to take advantage of increased government expenditure on armaments. Meanwhile newspaper reports about the Spanish Civil War and the political scene in Germany, and editorials about the risk of war, created a lot of demand for war-related toys. The Buyer had to look further afield to find someone to make them. He set sail for Japan, where he commissioned a factory to build tinplate tanks and rush them to the UK. On their arrival these quickly overtook his bakelite cars to become the stand-out best seller in 1937. Their intricate detail and camouflaged khaki-painted finish made them great value at sixpence each (2½p), and a must-have for boys. The popularity of castles and lead soldiers also increased. These had been a favourite in 1920s. 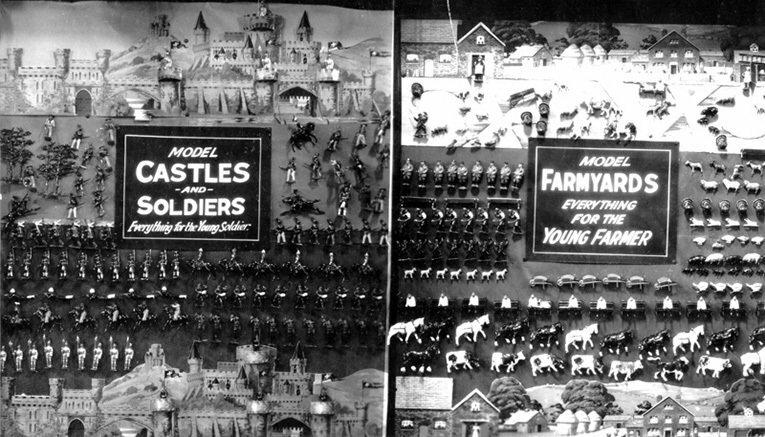 New, bold displays of Britain's Lead Toys also caused an unexpected rise in sales of their farm animals and farmyard scenery. Toy tinplate guns and gunslingers' belts, made from off-cut leather were also popular, and were marketed to cash-in on the popularity of Westerns in the cinema. Despite a brief lull in the war talk after the Prime Minister Neville Chamberlain returned from Munich on 30 September 1938 clutching a much vaunted 'piece of paper', sales continued to grow. Wooden boats became the latest craze. 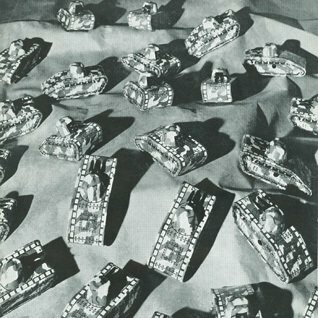 A very crude battlecruiser, which kids found floated in the bath, proved a winner, to rival Japanese-made tinplate aeroplanes. The Buyer couldn't resist a wry smile at his sales figures. The best seller was a tinplate "Red Baron's Bi-plane". Clearly British boys didn't know or care that the flying ace had been a German hero of the Great War! Customers rushed to Woolworth in droves upon the outbreak of war in September 1939. They stripped the counters bare as they hoarded items away in case shortages were to come. As factories were commandeered for war work, it proved harder still to re-fill the shelves. In most departments fancy decorative items were withdrawn in favour of more practical lines, and there was talk of the toy department being dropped altogether. But with the Company's Chairman William Stephenson now heading Aircraft Production for the Government, Downing Street soon invited Woolworth to suggest moves to boost morale on the Home Front, particularly for children. Plans were quickly adapted as the Buyers cottoned on that Toys could really help children as they endured enemy bombing huddled in air raid shelters. They asked Stephenson to arrange special supplies of paper and card for toy manufacture. He was able to oblige thanks to his new boss at the Air Ministry. Despite a reputation for being difficult to deal with, the Minister of Aircraft Production, the Canadian-born Press Baron, Lord Beaverbook, proved keen to help. As publisher of the Daily Express, such quantities of pulp were only chicken-feed, he said. He agreed to supply whatever was needed, on the understanding that Woolworth would hold the price of the items they made at pre-war levels, rather than seek to profit from his generosity. The products were crudely made. 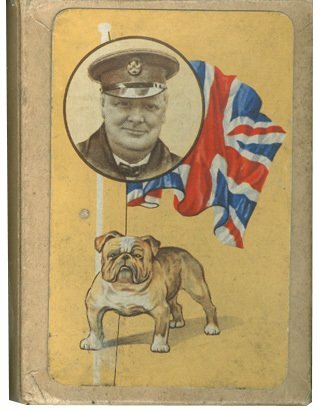 The war themes included a caracature of John Bull, a symbol of British courage, a cardboard boxing game which pitted a super-strong Winston Churchill against a rather feeble Adolf Hitler, and a selection of 'Lumar' patriotic jigsaw puzzles. RAF-supplied mini-planes were also sold to raise money to build Spitfires. 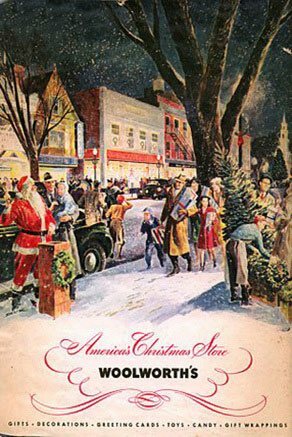 At Christmas 1940 the contrast between the Woolworth stores in Britain and America could not have been more extreme. Enemy action had destroyed twenty stores in the East End of London and along the South and East Coasts of England. The rest of the chain had limited stocks and had adopted a siege mentality. Three thousand miles away the USA was enjoying a period of prosperity. Public opinion was strongly anti-war, and the nation had declined to become entangled in what politicians considered to be a European conflict. F.W. Woolworth Co. published its first colour Christmas Catalogue, showcasing its extensive selection of gifts for all the family. 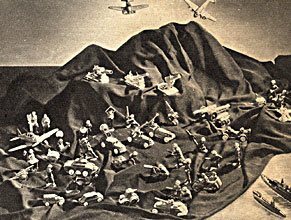 In an ironic twist, the main toy feature was captioned "It's a Small, Small world at Woolworth's" and promoted the corporation's range of toy soldiers and tinplate aeroplanes, ships and submarines. These were photographed in a layout format, grouped around a model harbour. Forward! Toys in ACTION advance from the sky, from the sea, from the ground! 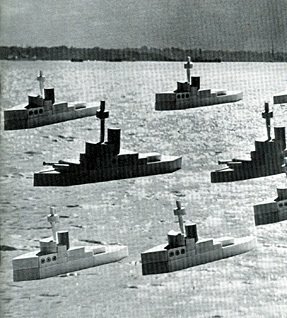 Uniforms, ammunition, and ships taken from U.S. Army and Navy models. Lead soldiers with searchlights, parachutes, cannons, radios, antennae, motor units, tanks, trench mortars, motorcycles, machine guns, planes ... a whole army in battle! Rubber battleships painted navy grey, lead toys, khaki colour. each 5¢ and 10¢ ! 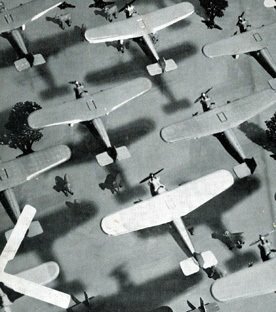 Most of the toys, including the planes and the rubber ships shown, had been made in Japan. The irony became apparent on 7 December 1941, when Japan launched an unprovoked assault on Pearl Harbour. The paper and card had other uses too. 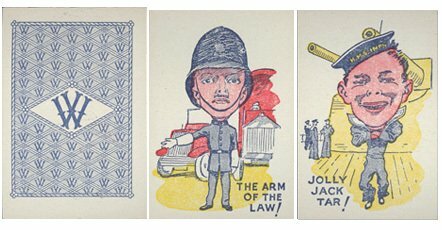 Playing cards remained a favourite, along with special war versions of Snap and Happy Families. Boxed games, including Battleships, Compendiums, and miniature chess were reserved for blitz-torn areas. The Woolworth Directors remained true to the promise they had made to Lord Beaverbook. The price of the austerity toys was held to sixpence, even when this meant selling at a loss. This was in sharp contrast with steep price rises on some other ranges across the store, which fully reflected the increased cost of manufacture, and still sold well. The toy stocks were directed to the towns and cities that were facing the worst bombardment. Many believe that it was the firm's contribution to the war effort, and particularly the steps that they took to maintain the morale of the nation's children and their mums through the Blitz, that sowed the seeds of success in later years. The American-owned chain had become quintessentially British, and found a special place in the hearts of a generation of shoppers. Many continued to support the stores right into the twenty-first century.